Chinese orbital launch vehicle. The 540 configuration for the Long March New Generation Launch Vehicle series would use the 5.0 m diameter core stage with four 2.25 m diameter stages as strap-ons. Payload was given as 10 metric tons to low earth orbit. A standard short 5.2 m diameter fairing tops the vehicle. Version dropped together with the 2.25 m booster module. 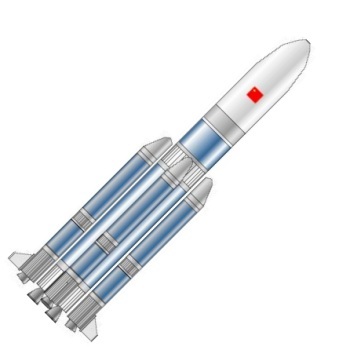 AKA: Chang Zheng Next Generation Launch Vehicle Type F;CZ-5-5.0;CZ-NGLV-F;Long March Next Generation Launch Vehicle Type F. Status: In development. Payload: 10,000 kg (22,000 lb). Thrust: 5,840.00 kN (1,312,880 lbf). Gross mass: 470,000 kg (1,030,000 lb). Height: 55.00 m (180.00 ft). Diameter: 5.00 m (16.40 ft). Span: 11.00 m (36.00 ft). Apogee: 200 km (120 mi). LEO Payload: 10,000 kg (22,000 lb) to a 200 km orbit at 52.00 degrees. Family: orbital launch vehicle. Country: China. Engines: YF-120t, YF-50t. Stages: CZ-NGLV-500, CZ-NGLV-200 stage. Agency: CALT.